FAST, easy, versatile & inexpensive 3-D solution. Fools sharp-eyed game ... turkey, deer & predators. Breaks up the human outline perfectly. Leaves are quiet, durable, machine-washable material. bow with black safety pins & adhesive pads. leaves for a Fall & Spring set. 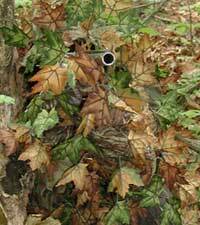 The Turkey Pro Sez: "When I first put Sneaky Leaves on my camo outfits, I was truly amazed! They made my clothing, including me, disappear in the woods instantly. "When I first put Sneaky Leaves on my camo outfits, tree stands, and blinds, I was truly amazed! They made everything, including me, disappear in the woods instantly. Game animals, especially turkeys and deer, are becoming more and more wary of human shapes and forms. They are spooked by the human form, even one that is motionless. And don't think deer won't spot you sitting motionless in a tree stand....they do all the time. Breaking up the With these 3-D leaves on your clothing, your outline disappears and game won't detect you. 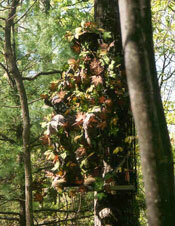 Use Sneaky Leaf Vines with Sneaky Leaves to conceal your blind or tree stand. Sneaky Leaves come in all the colors you need to blend into the woods at any time of the year. They take only a few minutes to attach to your clothing, gear, or Sneaky Leaf Vines. I even attach them to my gun and bow. Each Sneaky Leaf contains both a fall and spring set of leaves, which can be mixed and matched to make the blend and pattern you prefer. You'll not find a more effective, easy-to-use product which will make you invisible in the woods...and at such an economical price. Compare this product to expensive 3-D camo outfits or materialSneaky Leaves every time." Vine wrapped to illustrate usage. Leaves sold separately. Wrap a vine around your tree stand or blind to make it disappear. 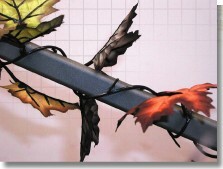 Sneaky Leaf Vines - a package comes with two 9 foot vines that can be easily attached to your tree stand or blind. 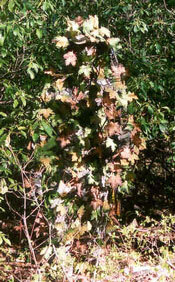 Each vine contains over 70 barbs into which Sneaky Leaves are attached, creating three-dimensional camo. Sneaky Leaves not included.